When my boyfriend proposed we raise chickens in our San Francisco Mission District backyard, one of his persuasive arguments was that we’d save a ton of money on eggs. As someone who consumes more scrambles than is probably healthy, I thought it was a genius money-saving plan. This actually (surprise!) did not turn out to be true; funding a chicken setup cost a little more than I had anticipated, and the idea that we’d be spending significantly less on groceries was obviously laughable. That said, owning chickens is really fun, worth the investment, and totally doable if you know what you’re getting into. Before you decide to tackle this daunting task, ask yourself the following questions: Do you mind getting up early … like, sunrise early? Are you okay with being dubbed the crazy house on your block? And most importantly, how much do you like eggs? If you answered “not really,” “sure,” and “I’m obsessed with them,” you are ready! Here is a play-by-play of what we did, complete with price points — though of course, numbers will vary depending on where you live. Follow in these sometimes-misguided footsteps, and you’ll hopefully end up with only a few gray hairs. 1. Read up on your city’s ordinance laws, because there would be no bigger bummer than going through all the effort only to get a fatty ticket. The City Chicken is a good starting point. But since you should never fully trust the integrity of a website made in MS Frontpage, check out your city’s municipal codes on the official government website as well. We learned that in San Francisco, each residence is allowed up to four small animals without a permit. Chicken coops can be built as long as they are 20 feet from all windows and doors, though you probably want to build at this distance even if it isn’t your city’s law — chicken funk is icky. Us: Hey, Landlord! Can we put a chicken coop in the backyard? We’ll keep it really clean, we swear! Landlord: Um, what? Oh, ha ha. [sarcastically] Sure thing, you crazy kids! Ha ha. Us: Check out our coop! Landlord: Oh, you weren’t kidding? Well, I guess it can stay. 2. Obtain that chicken coop your landlord very nicely approved. 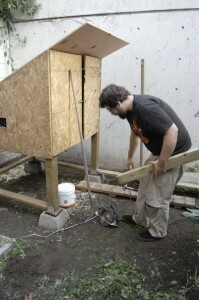 My boyfriend wanted the “full experience” of building a coop by hand because he is macho. I wanted to just buy one off Craigslist because I am lazy — so lazy I couldn’t be bothered to argue, so my boyfriend got his way. All in all, the building supplies cost us about $400, though it can be done way cheaper, I’m sure (check Craigslist) — we waterproofed the roof, built it high enough off the ground that we wouldn’t have to bend over to clean, and also made it large enough to house a family of six chickens. 3. Adopt your chickens! This is the most exciting part, especially if you decide to get them as cute baby chicks so you can raise them yourself and teach them to love you (spoiler alert: this doesn’t work). Chickens only thrive in communities; you need to get at least three so they won’t be so depressed they won’t lay eggs. Also, one of them might die — because circle of life — so prepare for that potential tragedy. Chicks are cheap; we bought ours for $5 each. Keep in mind that buying babies means you have to get special food pellets and build a small incubator with a heat lamp and thermometer to monitor temps since they won’t be able to live outside until they have all their feathers. It’s extra work and a little more money (about $60 for everything), but it is the only time in their lives they will be soft and let you hold them, so … worth it. Definitely. Our three hens yielded anywhere between 14 and 18 eggs a week, which was more than the two of us could eat. We used the extras as hush money so our next door neighbors wouldn’t call the cops when the chickens got into heated arguments at 5am. We also pawned off the chicken poop to our neighbors with gardens, which made us really popular. Another unexpected perk was that you can pretty much feed chickens anything: moldy bread, rotten fruit, whatever. In addition to it being good for their diet and saving you trips to the garbage bins, it helps cut the cost of buying new bags of feed (the cheapest stuff, found at feed stores that cater to farmers, is $15/50-pound-bag). Getting a noise complaint was my biggest worry, since sometimes our chickens screeched so loudly I was convinced our entire block would band together to get us a $100–300 fine (kill me) or evicted (please, seriously kill me so I don’t have to deal with this stress — eviction notices are devastating everywhere but especially here; San Francisco apartment-hunting is basically like The Hunger Games). I was so stressed out that my boyfriend eventually MacGyver’d a coop nightlight that we kept on until about 10 p.m. The chickens would idly stand in this pool of light, sometimes chirping preciously; when we turned it off, they would waddle themselves to roost like a bunch of drunk babies. For the most part, making them stay up past their bedtime (sunset) kept them quiet until a reasonable daylight hour. If they got loud during the day, I would either: put an ice cube in their nesting box to confuse them (they think their eggs went bad and it stuns them into silence) or put the noisiest one in a box and sit on it for about 10 minutes, or until she screamed herself to sleep and the less noisy ones get bored. 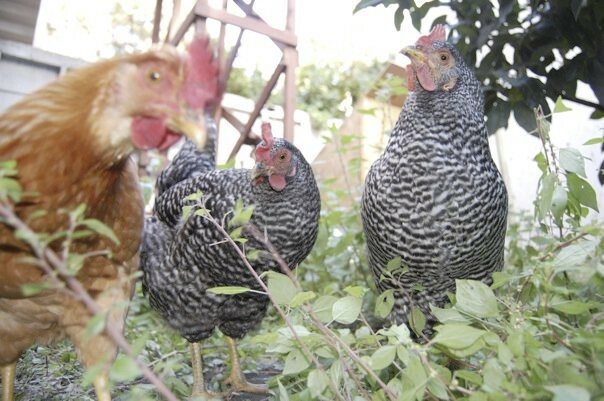 So there you have it — almost all you need to know about raising backyard chickens! Your final task: Learn a helluva lot of egg recipes, because you will need to eat them at least three meals a day to get your money’s worth. Rebecca Pederson is an editor at Yelp. Her Aunt Leslie loves her blog.